If you’ve spent any time in the fitness space, you’ve heard more weight loss pitches than a TV-loving insomniac. And if you’re like most people, you’ve probably gone in for a few. Well, it’s okay. We’ve all been there. And now we’re skeptical of anything that claims to help us lose weight faster. That’s good. We should be. That brings us to this article and to the supplement synephrine. It’s commonly found in pre-workout supplements because it’s a light stimulant and in fat burner supplements because it purportedly accelerates weight loss. How beneficial is it really, though, and what kind of results can you really expect? And what about dosages and side effects? Let’s tackle all those questions and more and find out if synephrine is worth your money and attention. Why Do People Supplement With Synephrine? What Are the Benefits of Synephrine? What’s the Clinically Effective Dosage of Synephrine? What Types of Results Should I Expect from Synephrine? Synephrine is a naturally occurring substance known as an alkaloid that’s found in plants. It’s particularly abundant in the bitter orange fruit, which is why it’s often referred to by that name. In Traditional Chinese Medicine, synephrine has been in use for thousands of years, obtained mainly via citrus peels. It’s chemically similar to the ephedrine and pseudoephedrine found in many over-the-counter cold/allergy medications and weight loss and energy supplements that contain ma huang. Studies show that synephrine speeds up your metabolism, which contributes to fat loss and weight management. If you want to lose fat, you need to burn more energy than you eat. Thus, anything that helps you burn more energy (like synephrine, caffeine, and exercise), can help you lose fat faster. This sounds like hooey, but there’s science to back it up, which we’ll get to in a minute. The bottom line is most people supplement with synephrine to lose fat of all kinds faster. How well does it work, though? As you would expect from a mild stimulant that increases energy expenditure, the main benefit of synephrine supplementation is faster weight loss. For example, one study found that a single dose of 50 milligrams of synephrine increased basal metabolic rate by 65 calories over the course of the next 75 minutes. Research shows that this metabolic boost can be significantly increased to over 180 calories by combining synephrine with two other molecules found in the bitter orange fruit: naringin and hesperidin. That’s the same amount of calories burned in about 20 minutes of jogging. That’s an additional 1,300 calories burned every seven days–a little more than one-third of the calories in a pound of fat. That matters. Furthermore, studies show that synephrine works synergistically with caffeine to enhance both caffeine’s and its own fat loss properties. That is, if you take caffeine and synephrine together, you’ll burn more fat than if you took them separately. It’s also worth noting that the synergism noted in a standard “ECA” (ephedrine, caffeine, and aspirin) stack also applies to synephrine. Research shows that another benefit of synephrine is it can increase the thermic effect of food, and especially in women. This means even more energy expenditure and thus more fat loss. Yet another benefit is something we already touched on–synephrine’s effects on stubborn fat. The fat-burning process in your body is regulated by chemicals called catecholamines. These molecules bind with receptors on fat cells and trigger the release of stored energy for burning. The problem, though, is some fat cells are resistant to mobilization. That is, they don’t respond to the catecholamines like other fat cells, which are easier to burn. These receptors are diametrically opposed in function in that alpha-receptors hinder fat mobilization and beta-receptors activate it. Thus, fat cells with a high amount of beta-receptors are relatively easy to burn (shrink, really, but you get the idea) whereas those with a high amount of alpha-receptors aren’t. Well, synephrine can aid in mobilizing stubborn fat cells by blocking the activity of alpha-receptors in fat cells. In other words, synephrine can help prevent the alpha-receptors in your fat cells from putting the brakes on fat mobilization. Last but not least is the fact that anything that has the ability to increase catecholamine activity can also suppress hunger between meals (a component of the fight or flight response). Synephrine’s appetite blunting effects have been demonstrated in animal research and have a fair amount of anecdotal support as well (many people find it’s an effective appetite suppressant). The clinically effective dosage of a supplement is the amount used in the scientific studies proving the benefits. You see, it’s not enough to just know that synephrine can improve fat loss. You need to know how much is needed to see results. And when you review the literature, you find a wide variety of dosages of synephrine used for weight loss purposes. The most effective dosages were in the range of 25 to 50 milligrams per day, though, with 50 milligrams significantly outperforming 25 milligrams. Like all natural supplements, don’t pin unrealistically high expectations on synephrine. A slight increase in your basal metabolic rate. A slight decrease in the activity of fat cell receptors that prevent fat mobilization. A slight increase in the thermic effect of food, or the “energy cost” of metabolizing food. That said, it doesn’t mean you shouldn’t supplement with syneprhine. It just means you shouldn’t supplement only with synephrine if you really want to see improvements. The same can be said about most natural supplements. By themselves, individually, they are underwhelming. Take the right ones together, though, and the cumulative effects can become noticeable. For example, if you pair synephrine with naringin and hesperidin, you can triple the metabolic boost. And if you add caffeine as well, the effects become even more pronounced. In terms of actual fat loss, if you took these four supplements every day (and especially before working out), it’s reasonable to assume an additional 0.5 pounds of fat loss per week. Well, several studies have demonstrated that synephrine doesn’t increase blood pressure, and research shows that it is generally safe and well tolerated. The reality is if you’re like most people, you’re not going to notice much when you take synephrine. Most report a slight increase in energy with none of the downsides generally associated with stimulants (jitters, nausea, rapid heartbeat, etc.). That said, if you have any medical conditions or take any medications that might contraindicate supplementation with synephrine, consult your doctor before use, of course. Examples are high blood pressure, anti-depressants, and HIV/AIDS. As you probably know, synephrine is primarily sold as a fat burner. If you know how to drive fat loss with proper diet and exercise, certain supplements can accelerate the process. Well, synephrine is one of those supplements. The problem, though, is its effects are rather mild and inconsequential when taken by itself. We recall that 50 milligrams can increase the basal metabolic rate by 60 to 70 calories. That’s not going to move the needle much. Fortunately, these effects can be safely and greatly amplified by several other molecules (naringin, hesperidin, and caffeine). 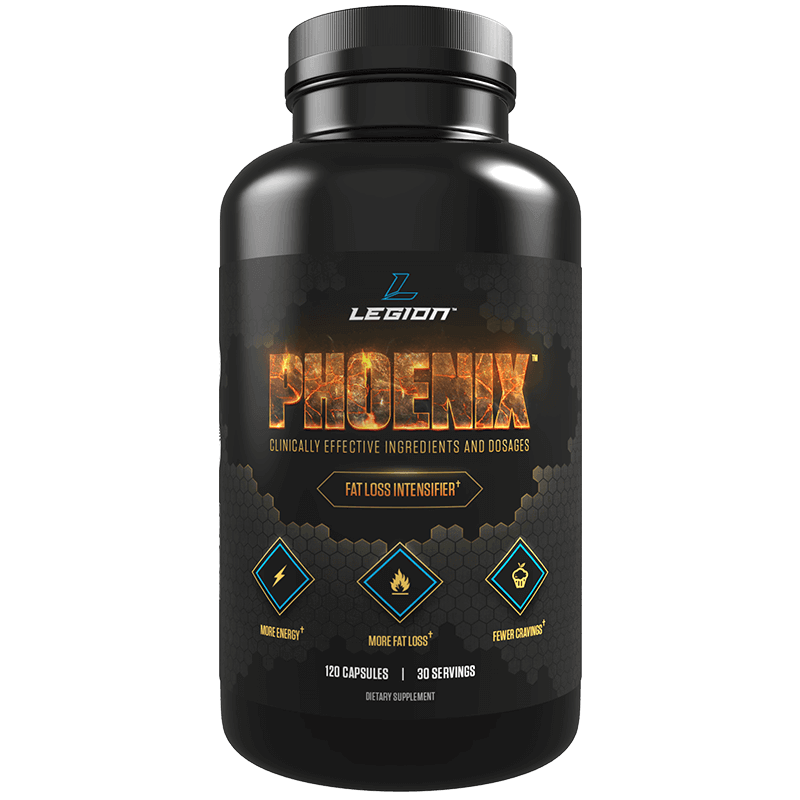 That’s why my fat burner PHOENIX contains a clinically effective dosage of synephrine, naringin, and hesperidin. I purposely left out the caffeine, though, because chances are you’re like most fitness folk and would prefer not to get your caffeine from pills. You want to get it from sources you actually enjoy like coffee and/or pre-workout drink. Well, PHOENIX allows you to do that. EGCG is a molecule found in green tea, certain types of nuts, and carob. It’s one of six similar molecules known as catechins, and it’s the one most implicated in fat loss effects. Specifically, studies show that EGCG inhibits the activity of a different enzyme also responsible for breaking down chemicals that induce lipolysis (the breakdown of fat for energy). In other words, EGCG keeps fat-burning chemicals in your blood for longer periods of time, where they can continue to break down fat cells for energy. This is why research shows it can help you lose fat faster, and abdominal fat in particular, faster. This is why studies show that supplementation with forskolin accelerates fat loss. Interestingly, research shows it can increase testosterone levels as well. Salicin is an anti-inflammatory agent found in foods like berries, olives, and mushrooms, and it is produced from willow bark. Like aspirin, salicin is metabolized into salicyclic acid in the body and thus is often used as a natural analgesic and blood thinner. Research shows that salicyclic acid inhibits the production of molecules called prostaglandins, which can hinder the metabolic effects of ephedrine and ephedrine-like compounds such as synephrine. Through this mechanism, studies show that salicyclic acid amplifies the metabolic boost caused by ephedrine and ephedrine-like compounds. I mentioned earlier that the synergism seen in the ephedrine, caffeine, and aspirin “stack” also applies to synephrine. Well, caffeine, synephrine, and salicin is the natural version of this, and that’s why we’ve included both synephrine and salicin in PHOENIX. Hordenine is a molecule produced naturally in the body and found in foods like barley, millet, and sorghum, and some types of cacti. Similar to EGCG, hordenine inhibits the activity of an enzyme responsible for breaking down chemicals that induce lipolysis. This allows these fat burning chemicals to remain in your blood for longer periods and therefore mobilize more fat cells. 5-HTP is a compound involved in the metabolism of the amino acid tryptophan, which is found in foods like milk, meat, potatoes, pumpkin, and various greens. It’s converted into serotonin in the brain, which is one of the principal neurotransmitters involved in feelings of happiness. This is why research shows that 5-HTP increases the feeling of fullness from food and thus can help you control your food intake. It can also reduce your cravings for carbohydrates in particular. Synephrine is one of the few fat loss supplements that are affordable and proven to accelerate weight loss (and especially when combined with several other supplements, as we’ve discussed). If your budget permits, they’re a worthy addition to your supplement cabinet. It can help you burn more calories and thus more fat, however, and attack the blubber covering your abs, hips, and thighs. And that, in time, can result in greater progress toward the body you really want. What’s your take on supplementing with synephrine? Have anything else to share? Let me know in the comments below!